Every morning my day begins with a version of coffee. Sipping down innumerable combinations of fine beans, milk, and style in our lifetime, each of us has spilled coffee at some point and so each of us is familiar with the stain it leaves. Before you succeed in removing the stain, you must have noticed that the stain is a ring! Even though the coffee had spilled over a region, on drying it formed a ring. Why does this happen? Is this effect limited to the spills and stains in the morning or does it have any scientific implications? The formation of ring in a coffee stain is an effect that occurs in any “colloidal” solution. A colloidal solution is a suspension of particles of size range 1 nm to 1000 nm in a solvent. These particles remain suspended in the solution and take long time to settle down. The use and application of colloids ranges from food industry (milk, whipped cream, mayo), cosmetics (foundation, lotion), pharmaceutical (syrups), agriculture and industrial (insecticide, aerosol, paints) to materials industry (optoelectronic devices, photonic crystals, biosensors). In this article, we will discuss the implications of the coffee ring effect on the colloids of materials industry. In the materials industry, ordered arrays/crystals of colloidal particles (e.g. silver, silica, gold) are used as building blocks of devices. 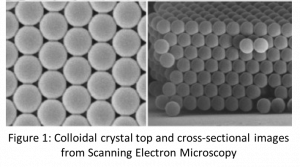 One of the most common ways of making these colloidal crystals as shown in Figure 1 is gradual evaporation of solvent from colloidal solution, causing particles to deposit on a substrate. This evaporation-induced crystal formation is akin to the drying of coffee stain on your desk. So the coffee ring effect causes formation of uneven colloidal crystals by accumulating more particles at the periphery than in the center. For electronics and sensing applications, a uniform assembly of colloidal particles is desired. Thus, the ring formation limits potential application of the colloidal particles. There have been various routes proposed to suppress the coffee ring effect, like using specific particle shape or size, patterned or surface modified substrates, specific medium of suspension, or controlling concentration of solution. But all these methods narrow down the application of colloidal crystals due to the specificity and complexity of their approach. In this work, the authors have devised a method to prevent coffee ring effect in silica colloidal crystals using just silicone oil. The silicone oil approach is simple, appealing, and efficient in its ability to control deposition with no modification to the substrate. To appreciate their approach let’s first understand the mechanism of coffee ring formation. 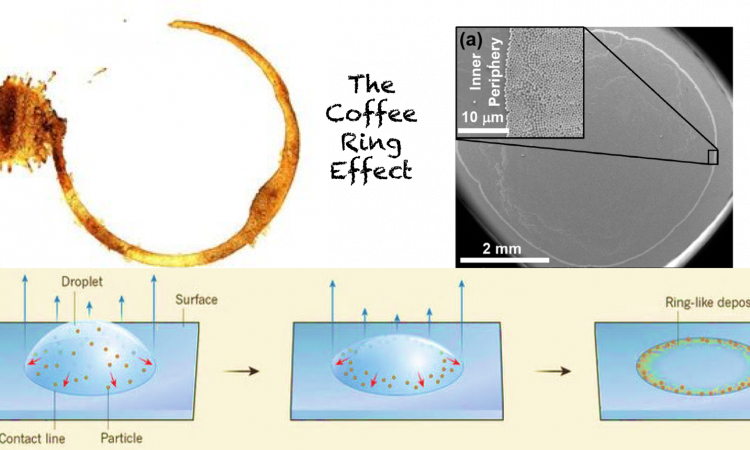 There are two major factors that cause coffee ring formation: high evaporation rate at the periphery and pinning of the droplet to the substrate, as shown in the Figure 2. The higher evaporation rate at the periphery causes the solvent to evaporate quickly in comparison to the interior, causing a capillary flow from center to edge. This flow is maintained by the pinned contact line causing accumulation of particles at the edge. The outer edge is ordered, but the ordering decreases as one moves to inner periphery. This happens due to less time available for each particle to settle down at the inner periphery as they reach in the last stages of drying. The interior is devoid of particles or has very few particles. So, if the particles are allowed to stay in the interior and are given enough time to assemble, we can get ordered crystals without rings. In the approach proposed here, the authors control the second factor of droplet pinning by using silicone oil coating on the glass substrate to prevent ring formation. In the presence of silicone oil the contact line of the colloidal droplet remains pinned only 25% of the evaporation time. Thus, the droplet contracts with evaporation allowing particles to remain in the interior and giving them enough time to assemble in an ordered fashion. Figure 3 compares normal drying and silicone oil mediated drying. Figure 3: (i) Comparison of the normal drying of colloidal droplet and silicone oil mediated drying. 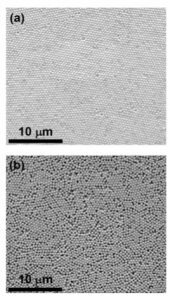 (ii) Colloidal crystal assembly (a) without silicone oil, (b) with silicone oil. Here since the particles at the center are least perturbed throughout the process, the ordering is more uniform in the center. However, the disorder increases as edge is approached because at the edge the particles face an additional force due to motion of the contact line and also get less time to settle due to higher evaporation rate. Thus, the presence of silicone oil at the interface of glass and colloidal drop promotes formation of ordered crystals at the center enabling use of colloidal arrays in devices. The authors moved a step further to get better crystals by exploring the impact of evaporation rate on the assembly. By running the assembly process for different times (10 min and 36 hours) under identical conditions, they found that slower evaporation rate resulted in a better assembly as shown in Fig. 4(a) due to more time available for the particles to assemble. On the other hand, faster evaporation did not give enough time for the particles to move around and order themselves, resulting in disordered structures as in Fig. 4(b). Once the crystal growth was complete, the authors washed away the silicone oil using ethanol leaving the substrate in its pristine form. In summary, the coffee ring effect is one of the major hindrances in formation of ordered colloidal crystals which form the building blocks of many devices in the materials industry. In order to realize complete potential of colloidal crystals in optoelectronic, photonic and magnetic devices, it is necessary to get rid of the coffee ring and have macroscale crystals on substrates. Using silicone oil as an interface between substrate and colloidal solution, it is possible to control crystal growth at regulated evaporation rate. The strength of this approach is its simplicity which allows formation of large colloidal crystals without permanent modification to the substrate. With this publication establishing a proof of concept for this approach, efforts are underway to apply this in the device making process which use colloidal crystal arrays.